This page is updated monthly with current news and events. Join us on Facebook for more news and weekly updates. Colin Rosewell is a regular 'visual arts' presenter on 'Smart Arts'. A 60 minute arts talk show hosted by Scott Levi and Australian television personality Chris King - theatre, drama and performance. 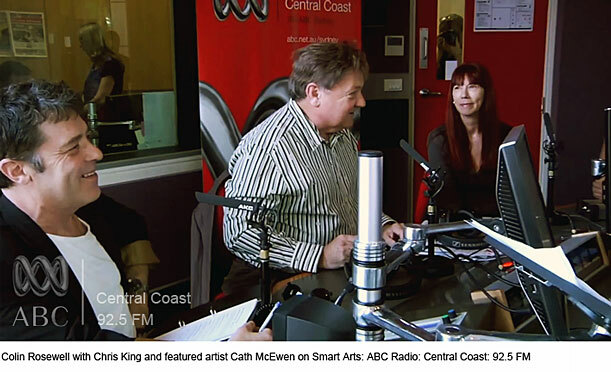 Broadcast live every Friday between 2.00pm and 3.00pm on ABC: Central Coast 92.5 FM, 'Smart Arts' regularly features interviews with local artists and provides a 'what's on' guide to current exhibitions, art competitions and cultural events. Due to the growing popularity of the arts on the Central Coast, any local artist(s) wishing to appear on 'Smarts Arts' as a featured artist or to promote an up-and-coming event, should contact Colin Rosewell, Chris King, Scott Levi or Brad Storey by telephone or email at least 10 days in advance.